The machine is running Windows Server 2008 R2. We're developing our Web Application using Visual Studio 2008. According to Microsoft the code 8007000d means there's a syntax error in our web.config -- except the project builds and runs fine locally. Looking at the web.config in XML Notepad doesn't bring up any syntax errors, either. I'm assuming it must be some sort of poor configuration on my part...? Assistance is greatly appreciated. Thanks! Ok, since I posted the original question above, I've tracked down the precise lines in the web.config that were causing the error. Note: If I delete the lines between the <httpHandlers> I STILL get the error. I literally have to delete <httpHandlers> (and the lines inbetween) to stop getting the above error. Looking at these lines it's clear the problem has migrated further within the same <system.webServer> tag to the <handlers> tag. Could not load file or assembly 'System.web.Extensions, Version=1.0.61025.0, Culture=neutral, PublicKeyToken=f2cb5667dc123a56' or one of its dependencies. The system cannot find the file specified. Obviously I think these new errors have just arisen from me deleting the <httpHandlers> tags in the first place -- they're obviously needed by the application -- so the question remains: Why would these tags kick up an error in IIS in the first place??? Do I need to install something to IIS to make it work with them? Here's the troublesome bits of our web.Config... I hope this helps someone find our problem! I had these exact symptoms and my issue was similar to Peter's. Was setting up an existing project on a new server. My project referenced the IIS7 URL Rewriting module, but that hadn't been installed yet on the new server. Installing it fixed my issue. You can use the Microsoft Web Platform Installer to install it. Execute it, select Products, in the left menu select Server and find URL Rewrite in the list and install it. After battling with this for a day on a new machine I came across the following links. I was missing the rewrite modules. This fixed everything. Aha! I beat this problem! My god, it was a beast for someone like me with limited IIS experience. I really thought I was going to be spending all weekend fixing it. Here's the solution for anyone else who ever comes this evil problem. First thing to be aware of: If you're hoping this is your solution, make sure that you have the same Error Code (0x8007000d) and Config Source (-1: 0:). If not, this isn't your solution. Next thing to be aware of: AJAX is not properly installed in your web.config! Same issue on Server 2016, IIS 10, 500.19 error. I installed the redirect module and it worked. I do not know why this was not included by default. To be clear it looks like the web.config from IIS 7 will work, or is designed to work, but the lack of this module gives the really odd and unhelpful error. Googling takes you to a Microsoft page which insists that your site is corrupted or your web.config is corrupted. Neither seems to be the case. A possible cause is a x86 dll in a 64 bits app pool, the solution is to enable 32 bits apps in the application pool settings. For me, re-registering asp.net for iis did the trick. Hopefully that helps someone else. Check that all IIS referenced modules are installed. In this case it was the AJAX extensions (probably not the case these days), but URL Rewrite is a common one. Another way of getting 500.19 errot for no apparent reason is - missing directories and/or broken permissions on them. IIS installer usually creates the wwwroot for you and that's the default root folder for all websites and mount point for virtual directories. It always exists, so no problem, you usually don't care much about that. Since web.config files are hierarchical, you can put there a master web.config file and have some root settings there, and all sites will inherit it. IIS checks if that file exists and tries to load it. This directory will exists if you have IIS properly installed. If it does not exist, you will get 500-class error. However, if you play with file/directory permissions, especially 'advanced' ones, you can actually accidentally deny IIS service account from scanning/reading the contents of this directory. If IIS is unable to check if that wwwroot\web.config exists, or if it exists and IIS is not able to open&read it - bam - 500-class error. However, for full IIS it is very unlikely. Developers/Admins working with full IIS are usually reluctant regarding playing with wwwroot so it usually stays properly configured. Usually, IIS Express "just works". 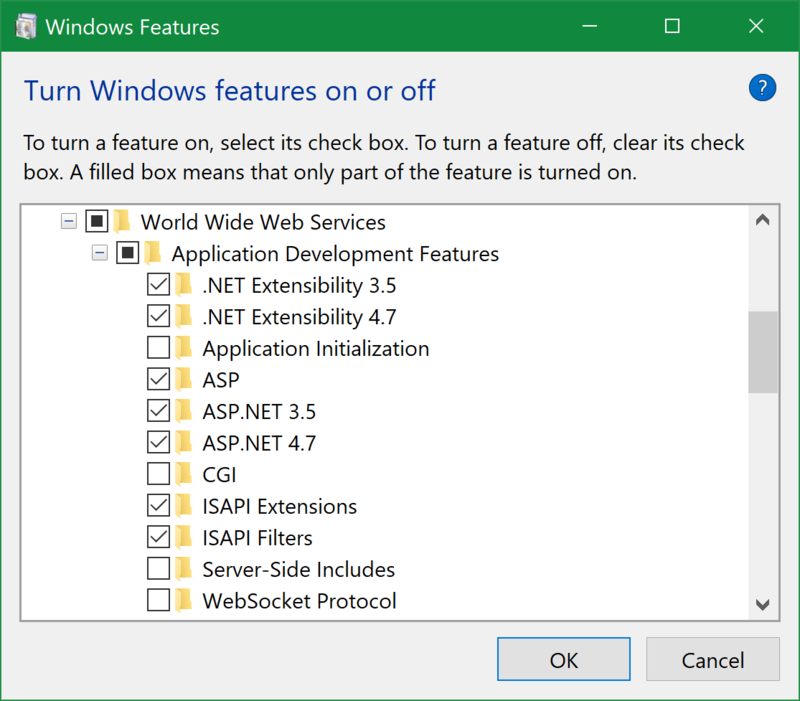 Often, developers using IIS Express often are not aware how much internally it resembles the real IIS. You can easily stumble upon the fact that IIS Express has its own applicationHost.config file and VS creates and manages it for you (correctly, to some extent) and that sort of an eye-opener telling you that it's not that simple and point-and-click as it seems at first. Aside from that config file, VisualStudio also creates an empty directory structure under your Documents folder. If I remember correctly, IIS Express considers these folders to be the root directories of your website(s) upon which virtual directories with your code are mounted. Later, just like IIS, when IIS Express starts up, it expects these folders to exist and checks for root web.config files there. The site web.config files. Almost always, these web.config files are missing - and that's OK because you don't want them - you have your **application web.config", they are placed with rest of the content in a virtual directories. Now, the second fun part is: IIS Express expects that empty directories. They can be empty, but they need to exist. If they don't exist - you will get a 500-class error telling you that "web.config" file at that path cannot be accessed. The first time I bumped into this problem was when I was clearing my hard drive. I found that 'documents\websites' folder, full of trash, I recognized several year-old projects I no longer work on, all empty, not a single file, so I deleted it all. A week later - bam - I cannot run/debug any of the sites I was working at the moment. Error was 500.19, cannot read config file. Go there exactly where the error indicates, ensure that these folders exist, ensure that IIS worker account can traverse and read them, and if you notice that anything's wrong, maybe it will be that. BTW. In VisualStudio, on ProjectProperties/Web there's a button "Create Virtual Directory". It essentially does this very thing, so you may try it first, but IIRC it can also somethimes clear/overwrite/swap configuration sections in applicationHost.config file, so be careful with that button if you have any custom setups there. This may or not be related....I started off with the same error mentioned above, started googling, making changes, getting new errors, endless loop. The change that got me by that error was messing with the Feature Delegation in IIS Manager under the Management section of the server. I'm sorry I can't remember which one I changed, but googling might help. I had started this app on a 32 bit windows xp box, and I am now running it on a 64Bit Windows 7 box. So hopefully this helps someone else. My IIS 7.5 does not understand tag in web.config In VS 2010 it is underline that tag also. Check your config file accurate to find all underlined tags. I put it in the comment and error goes away. Comment the following lines in the web.config file. I had the same error. I had an IIS site with .net framework version 2.0, but my app needed 4.0. I changed the version and it worked. Posting just as a reminder if someone might have the same issue. In my case, there was something wrong with the .NET Core Windows Hosting Bundle installation. I had that installed and had restarted IIS using ("net stop was /y" and "net start w3svc") after installation, but I would get that 500.19 error with Error Code 0x8007000d and Config Source -1: 0:. I managed to resolve the issue by repairing the .NET Core Windows Hosting Bundle installation and restarting IIS using the commands I mentioned above. I had the same issue in Windows 7. I got this error by putting the <customErrors> tag inside of <system.webServer> instead of <system.web> where it belongs. There was a little squiggle under the <customErrors> tag but I didn't notice it right away. Make sure all of your IIS features are properly enabled. Open Windows Features (Turn Windows features on or off). This lovely detailed error is still present in 2019! I just want to add that if your web.config is valid and accessible it most likely is a dependency issue. As mentioned by the OP it was a AJAX module, and as by others commonly the Rewrite module. Just keep your eyes open in your web.config what modules and libraries your tags are referencing to since the error code 0x8007000d can be about ANY dependency. In my case I didn't realize the AspNetCore bundle was missing and had to be installed! So happy I found this post!! Not the answer you're looking for? Browse other questions tagged asp.net iis web-applications web-config iis-7.5 or ask your own question. How to solve internal server error 500.19 after upgrading application on VS 2017?